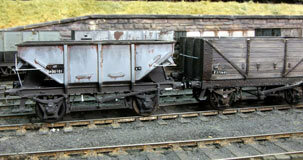 Tyne Dock-Consett 56 ton iron ore wagon. One of the sights of the steam age was the transport of iron ore up the bank to Consett using trains of 8 or 9 of these unique wagons. Cast whitemetal doors complement an accurate detailed etched body. Only couplings and wheels (Lowmac type) are required. 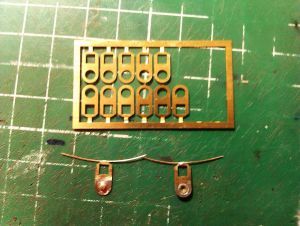 £30 + £2.00 P & P.
Upgrades the Dapol/Hornby model. Parts are provided for 4 wagons, 3 using the original plastic underframe. The etch contains steps, handrail brackets, door handles, platforms, etc. 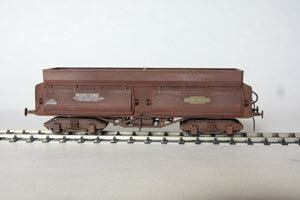 and a scale chassis with NER type clasp brake gear and high lever. Several different detail versions are possible and you can always build a higher percentage of wagons with the scale underframe. Review in MRJ #83. £12.00 each, 5 for £55 + £1.50 P & P per order. way to fit glazing. The only casting provided is the brake cylinder. 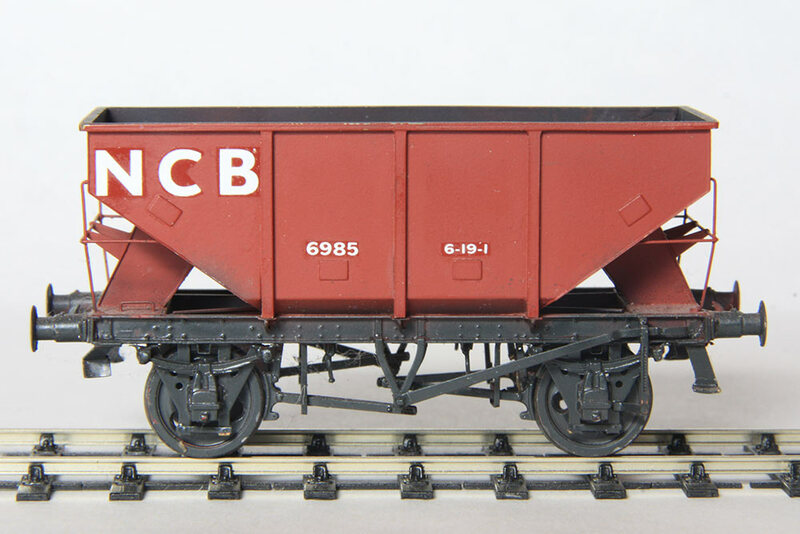 £28 + £1.50 P & P.
14 ton and 16 ton Charles Roberts steel hopper wagon. 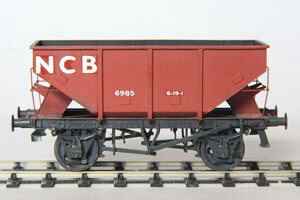 Common NCB wagons built from the early 1950s. 2 different kits. Etch only. £25 + £1.50 P & P.
Diagrams 1/142 and 1/144. 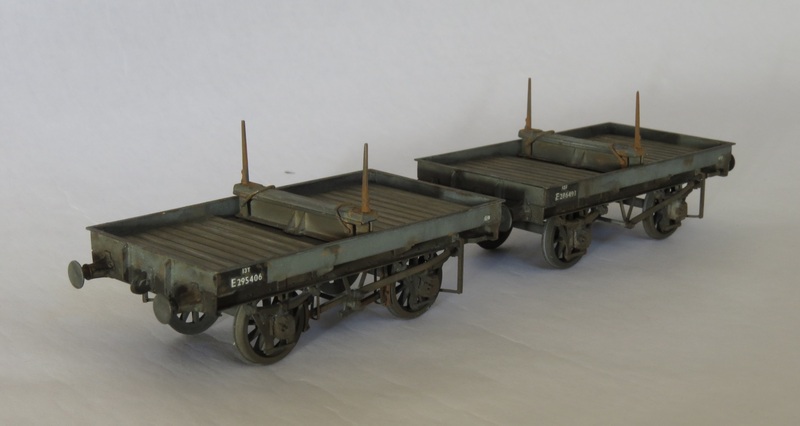 Probably based on early versions of the above these wagons were built between 1949 and 1953. This etch builds into the distinctive 10ft. wheelbase underframe with two V hangers on one side. Overlays are provided to enable the wooden solebar version to be produced with the addition of brass angle. Axlebox, spring and brake cylinder castings are required. £20 pair + £1.50 P & P.
curves. Described in MRJ #64, these elegantly simple units are now available in four wheelbase versions: 10ft, 8ft 6in and 8ft. 7ft wheelbase are available and currently in stock. Please state wheelbase when ordering. £8.50 per pair + £1.50 P & P per order. Chris Pendlenton designed these “boxhead” couplings as the final element in his battle to propel long rakes of coaches reliably round reverse curves with Pullman style gangways touching and all forces taken at the coupling like prototype Buckeye fitted stock. 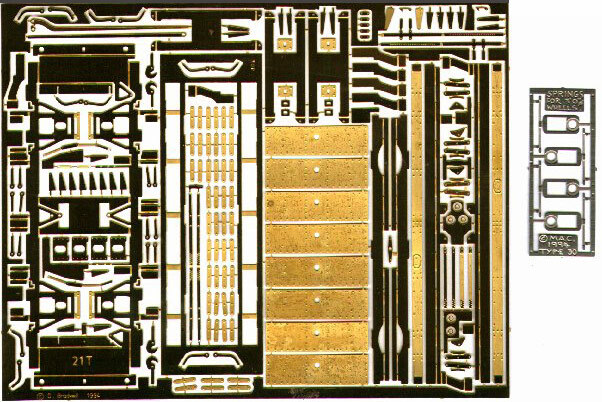 MRJ 200 described these and other innovations as applied to Bachmann Mk1 coaches. £10 sheet of 12 pairs + £1.50 postage. A fret of 16 spring plates, designed to convert plastic wagon chassis to sprung suspension. Reviewed in Scalefour News 186. The North-East of England had an obsession with single bolsters building large numbers until, in the 1950s, someone discovered that, perhaps, the new fangled bogie bolsters were a much better way of carrying long loads and outstanding orders for large numbers were cancelled. The kit is for the 8 ft wheelbase all steel type built to diagram 197 from 1945. 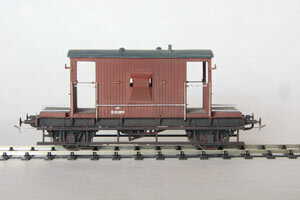 The BR 10 ft wheelbase version is available as a different kit, same price. £25 per pair, etch only + £1.50 P & P per order.